Chevrolet Dealer, Serving Calgary in Alberta. Auto sales, Chevrolet auto parts, auto service, and financing. 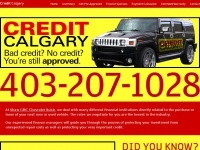 The web server used by Calgaryautofinancing.ca is run by GoDaddy.com, LLC and is located in Scottsdale, USA. There are many websites run by this web server. The operator uses this server for many hosting clients. In total there are at least 326 websites on this server. The language of these websites is mostly english.